Udeme Odibi, the 47-year-old Lagos-based lawyer, who reportedly stabbed her husband to death, was supposed to travel abroad a day before the crime was allegedly committed. It was gathered that she had arranged her luggage, preparatory to the journey on Wednesday, but reportedly decided to shelve the plan. The incident happened in the early hours of Thursday at the couple’s residence on Diamond Estate, Sangotedo, in Ajah area of Lagos State. A source, who confided in The Punch, stated that the suspect had been abroad since December 2017 before returning to Nigeria in April 2018. 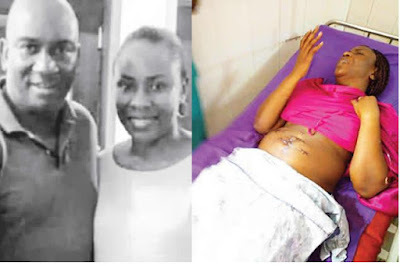 Punch had reported that Udeme stabbed her husband, Otike, with a knife, ripping out his intestines. She was also said to have severed the p*nis of the deceased, placed it on his hand, and attempted to take her own life too but to no avail. The Lagos State Police Command, which confirmed the incident, said the late husband had called a neighbour, his younger sister and mother on the telephone on Wednesday night, informing them of his wife’s threat to kill him. It was gathered that the duo’s three-year-old marriage that had not produced a child, was fraught with domestic violence. The Punch gathered from a credible police source on Friday that the woman used to work with the deceased in his chambers and had a running battle with him over female clients, who visited him at work.